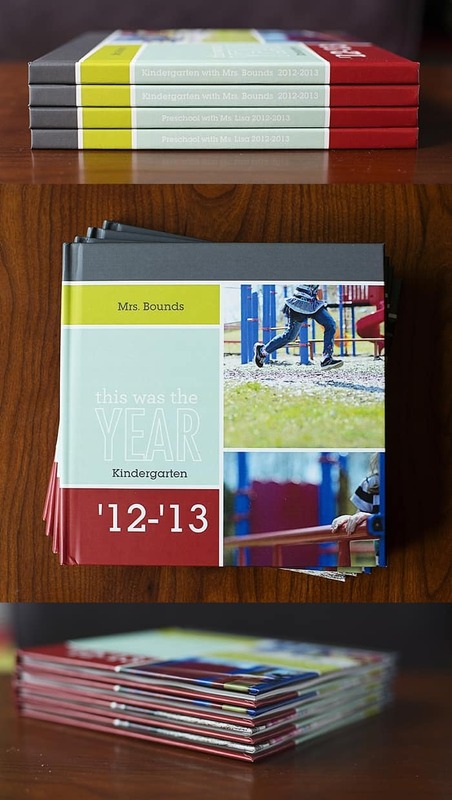 Follow these tips and tricks and create a one-of-a-kind teacher gift this year. I’m sure you remember having one or two over the course of your educational career: a really great teacher. He wasn’t there because it was his job. She wasn’t up there speaking to pass the time and earn a paycheck. He wasn’t just a nice and friendly face. She wasn’t teaching just to prepare you for a test. He was truly passionate about the subject he explained. But beyond that, she wanted to instill within you a love of learning and the joy of discovery, for a lifetime. My little guy started kindergarten in August of 2012, and he (and I!) could not have been more blessed with the gift of his teacher. To say I adored her is quite an understatement. She was remarkable in so many ways, and I was so utterly grateful that my son had his introduction to formal education in her classroom. Perhaps it sounds a tad dramatic, but I believe kindergarten is a hinge pin upon which their future scholastic success rests. It is the transition from little child to big kid; the transition from carefree to purpose; the transition from frivolity to endeavor. It leaves a taste in their mouths, good or bad, about the next twelve years of their lives. To have a teacher gently coax you into the structure of an educational setting, in a safe, warm, and loving environment, where the glory and beauty of the world is embraced, and the excitement and joy of learning is transposed…. It is a gift. To purchase something, or even craft something, as an end of the year gift just didn’t seem to be enough to cover the depth of my gratitude for Little Buddy’s Kindergarten teacher. Inspired by the Mother’s and Father’s Day questionnaires that I’ve seen online, I decided to create a Teacher Questionnaire for the classmates to answer. See the full list of questions and instructions for this photo project! I would compile all of the answers into a book, including a photo of each child, and give that as a wonderful memento of each unique kid’s personalty and the impact the teacher had made upon them. For the 2011-2012 school year, I did this for my kids’ preschool teachers. It turned out super cute and you can see that post here. I asked each parent to conduct the questionnaire for their child and email me a photo to use. 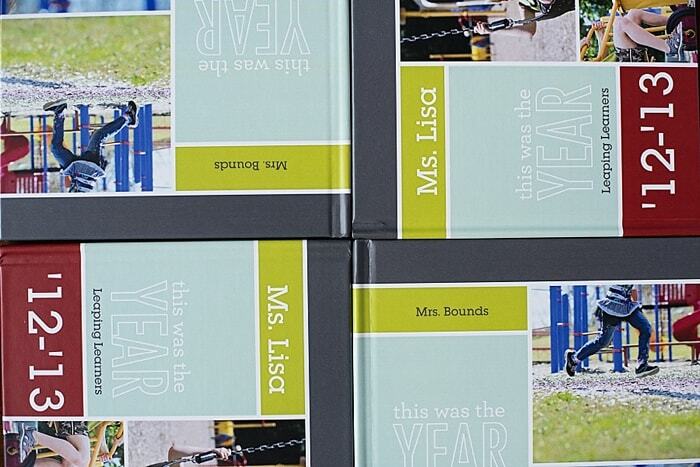 In 2012 and 2013, I used Paper Coterie’s “This Was The Year” photo book template to compile all the info into a most awesome gift book. This project is a little bit of work to complete, but the rewards are so worth it. 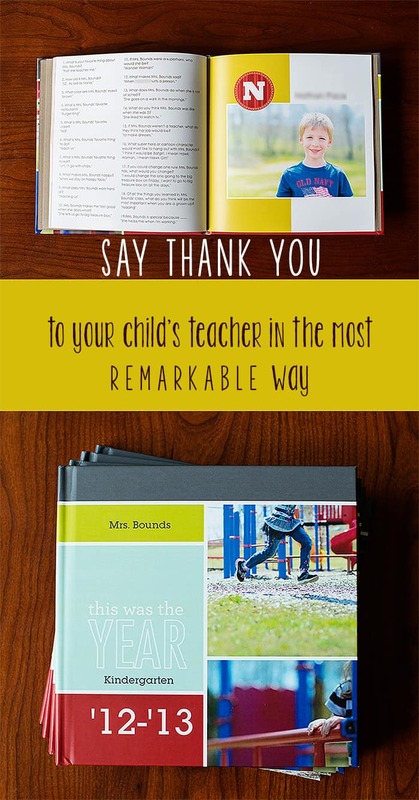 If you are looking for a significant, heartfelt, meaningful and remarkable end of the year teacher gift idea, this is it! 1. Email out the questionnaire to each parent and ask them to send the child’s answers back to you by x date. Give yourself plenty of time. People will be late, it takes time to input all the info into the online software, and then you have to wait for printing and shipping. It may be mid March now, but that’s really an ideal time to start in order to complete by mid May. ***You may want to consider a little clause that if you don’t receive a response by your due date, then that child’s contribution will not be included in the gift. Yes, that sounds mean. But let me speak from experience, it will save you grief later by not having to hound and chase down the info from one or two straggling parents later. 2. Narrow down the list of questions to 10-12 of your favorites — in hindsight, it was too long for this age child. 3. 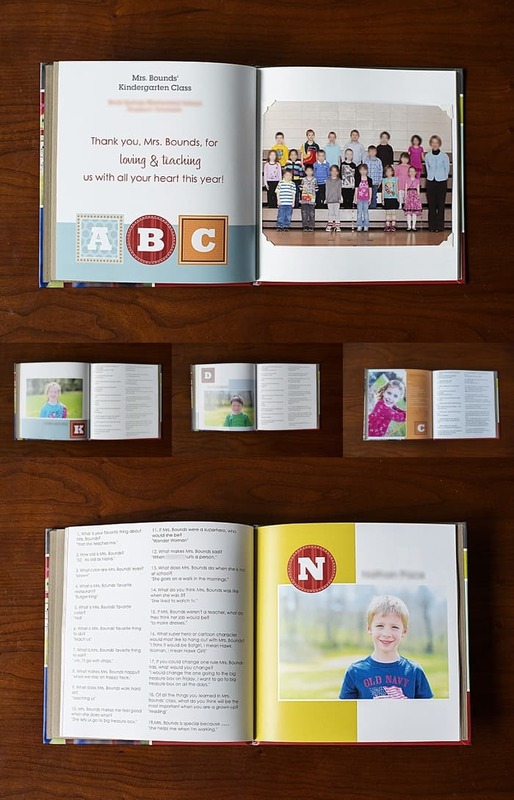 Request a non-copyrighted, full resolution jpg image of each child to use in the book. If you are a mom-tographer, consider offering an afternoon for parents to bring their child by so you can take a great quality photo to use in the book. That’s what I did. 4. As the answers come in, go ahead and add those to your Shutterfly / Blurb / Other Book Vendor etc. book project online. Then it is never one huge daunting task to complete all at once. 5. 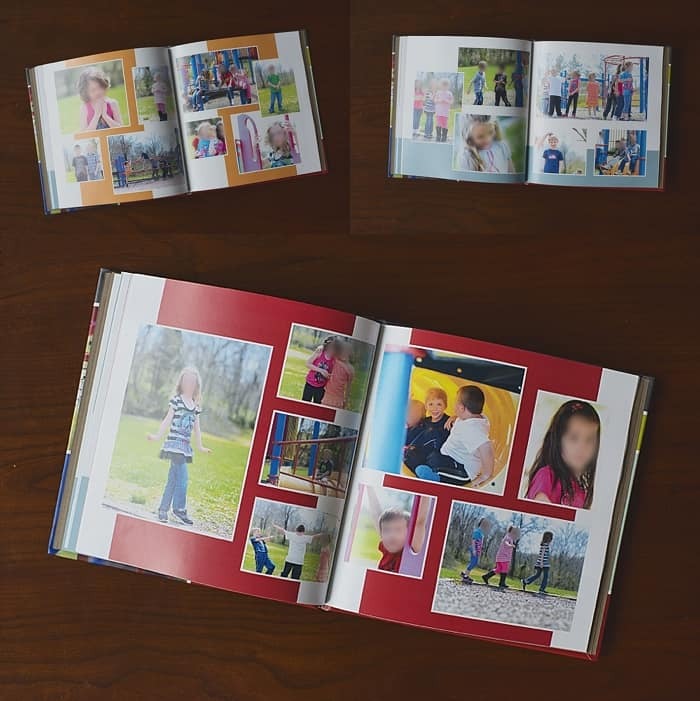 Use some photos from outside their school on the cover that don’t include faces. 6. Initiate a play date at your school’s playground on a Saturday and get some “playtime” photographs. Include these in general collage photo spreads at the back of the book. 7. Consider asking parents to send in any field trip or action photos they’ve taken of the class, to also use in general photo spreads. 8. Let each child sign their name on their page spread once the book comes in. 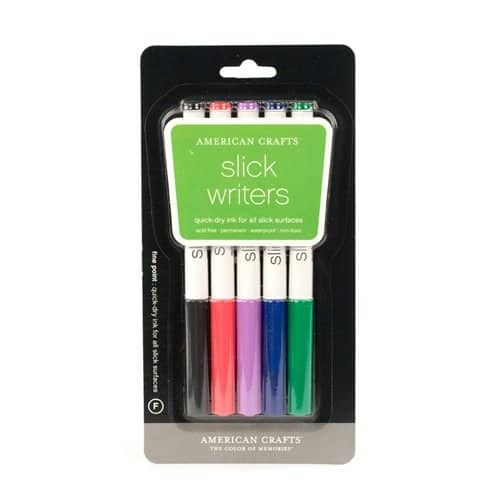 I used Slick Writers markers that dry instantly so the kids can’t smear their signatures. With a multi-colored pack, each child got to select their favorite color. 9. Add a copy of the official class photo digitally if you have it, or use photo corners (or ones like this) to add it in scrapbook style. 11. Other parents may want a copy of the book too, so make sure to ask how many copies you should order when you send out the questionnaire. 12. If the children are older and more proficient at writing, consider ordering the book with blank spaces for answers. Find a time to let each child write their answers themselves! Lastly, here is the huge list of questions to ask the children about their teacher. Be ready to write down their unique responses. Those little idiosyncrasies really make the book! What is your favorite thing about Mrs. Robin? How old is Mrs. Robin? What color are Mrs. Robin’s eyes? What is Mrs. Robin’s favorite restaurant? What is Mrs. Robin’s favorite color? What is Mrs. Robin’s favorite thing to do? What is Mrs. Robin’s favorite thing to eat? What makes Mrs. Robin happy? What does Mrs. Robin work hard at? Mrs. Robin makes me feel good when she…. What two/three words do you think most describe Mrs. Robin? If Mrs. Robin were a superhero, who would she be? What does Mrs. Robin do when she is not at school? What do you think Mrs. Robin was like when she was 5? If Mrs. Robin weren’t a teacher, what do they think her job would be? What super hero or cartoon character would most likely hang out with Mrs. Robin? If you could make one rule that Mrs. Robin had to follow, what rule would you make? If could change one rule Mrs. Robin has, what would you change? Of all the things you learned in Mrs. Robin’s class, what do you think will be the most important when you are a grown-up? Mrs. Robin is special because ……. Last year’s book turned out utterly amazing. To see the finished product, with all 18 children’s unique, charming, funny, sometimes hilarious, and tender hearted answers was a blessing. It was a treasure for me to see as a parent who got to know these beautiful children. I cannot imagine how much more of a treasure it would be for the teacher who has sacrificed, given of herself unconditionally over and over, and fought to win their hearts over to a love of learning for their lifetimes. To read in their very own words the impact he or she has made on them. Good luck on YOUR one of a kind gift! Carey Pace is a writer/blogger and Natural Light Lifestyle Photographer who is downright passionate about documenting the real and beautiful ordinary, everyday moments of life. 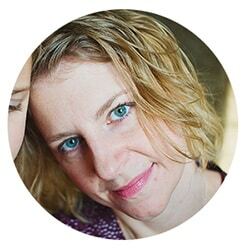 She has a raw, honest, yet conversational voice with a storytelling twist in both her words and images. She lives in Kingsport, Tennessee and writes about the things on her heart like motherhood, the trials and triumphs of raising children, feeding her family beautiful and healthy food that tastes scrumptious, and loving Jesus with all her heart. You can find Carey on her blog, Facebook, Instagram, and Pinterest. Do you love Carey’s photos as much as I do? 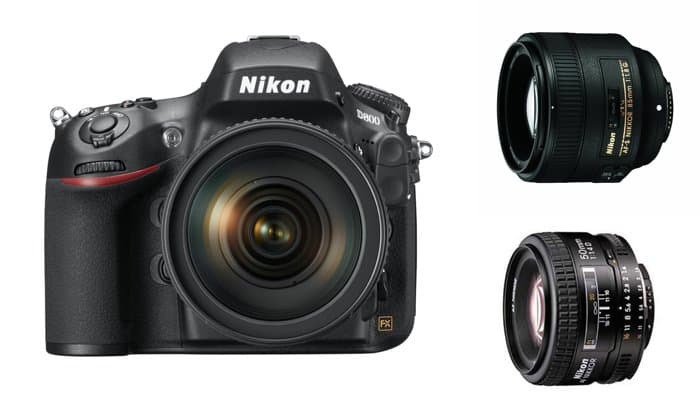 She shoots with the Nikon D800 and 50mm 1.4D and 85mm 1.8.
best end of the year gift I’ve ever seen. hands down. I can’t believe Paper Coterie has gone out of business! Auuugh! As a former teacher I must say, this is a WONDERFUL idea! Sure beats another coffee mug! I LOVE this idea and want to do this this year for my daughter’s kindergarten teacher. I can’t tell from the pictures…did you re-type the questions and student responses on each page? Also, if there were several kids that had the same first initial, did you just repeat the letter for each page? Thank you for sharing this idea. I’m so sorry that I didn’t see this comment earlier! I copied and pasted the question list into the text box, and then copied and pasted the responses that the parents sent to me, for each question. Yes, it was time consuming. Not difficult, but time consuming. And yes, I just repeated the letters if that was necessary. What vendor did you use for your book? I LOVE the design but cannot find it anywhere! What website did you use for this book? I love the style. Also what size book did you make? 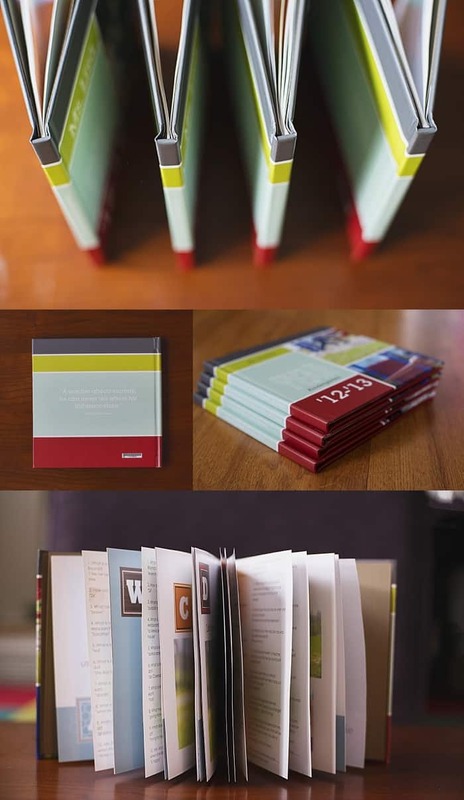 I love this idea, but can’t find a similar template anywhere. Any suggestions? Thanks!